Competitive Price! Stocking Propane Tanks in 20, 30, 40 & 100 lb. tanks! Ace 48" F40 T12 or F32 T‑8 Universal Fluorescent Bulb 2/Pk. Max® AA or AAA 16/ pk., C or D 8/pk., 9‑volt 4/pk. or Lithium AA or AAA 8/pk. 3380607, 3233228 Limit 4 at this price. Miracle‑Gro® Moisture Control® Potting Mix, 2 Cu. Ft. 7301609. Limit 2 at this price. Black & Decker® Sheet Sander, Drill, Angle Grinder 2414621, 2415040, 2415693. Limit 4 at this price. ‑$8 With Ace Rewards Card,* You Pay $29.99. Limit 2 at this price. 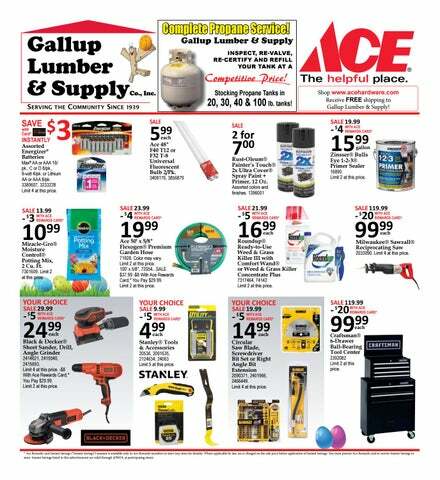 Shop www.acehardware.com Receive FREE shipping to Gallup Lumber & Supply! Rust‑Oleum® Painter’s Touch® 2x Ultra Cover® Spray Paint + Primer, 12 Oz. Zinsser® Bulls Eye 1‑2‑3® Primer Sealer 16890. Limit 2 at this price. 71928. Color may vary. Limit 2 at this price. 100' x 5/8", 72054...SALE $37.99 ‑$8 With Ace Rewards Card,* You Pay $29.99. Limit 2 at this price. Stanley® Tools & Accessories 20536, 2091635, 2124634, 24063 Limit 5 at this price. Milwaukee® Sawzall® Reciprocating Saw 2033090. Limit 4 at this price. 7317464, 74142 Limit 2 at this price. Circular Saw Blade, Screwdriver Bit Set or Right Angle Bit Extension 2090371, 2401966, 2466449. Limit 4 at this price. Craftsman® 6‑Drawer Ball‑Bearing Tool Center 2392082 Limit 2 at this price. * Ace Rewards card Instant Savings (“Instant Savings”) amount is available only to Ace Rewards members in store (see store for details). Where applicable by law, tax is charged on the sale price before application of Instant Savings. You must present Ace Rewards card to receive Instant Savings in store. Instant Savings listed in this advertisement are valid through 4/30/19, at participating stores. 42 gal., 20 ct. or 55 gal., 15 ct. 6038574, 6093082 Limit 3 total at this price. 6187116, 6214910, 6225858. Limit 4 total at this price. Covers 5000 sq. ft. 7475379 Limit 2 at this price. Covers 5000 sq. ft. 7475403 Limit 2 at this price. 4.25 peak hp. Includes 7' hose, 2 extension wands, car nozzle, utility nozzle, wet nozzle. 2560282. Limit 4 at this price. 72"H x 34"W x 14"D. 5396221. Limit 3 at this price. Roundup® Ready-To-Use Weed & Grass Killer III with Pump ’N Go® Sprayer, 1.33 Gal. Select C&S® Suet, 11-3/4 Oz. * Ace Rewards card Instant Savings (“Instant Savings”) amount is available only to Ace Rewards members in store (see store for details). Where applicable by law, tax is charged on the sale price before application of Instant Savings. You must present Ace Rewards card to receive Instant Savings in store. Instant Savings listed in this advertisement are valid through 4/24/19 - 4/29/19, at participating stores. 21.12 Sq. Ft., Canyon Cherry, Rio Grande Cherry. 10012A, 4838. Action Security Iron Security with style, full line of steel products. Security doors, gates, window guards & decorative products. Check out our doors in-stock, visit with Oscar for customized order. Displays and material swatches to view. Sultana in the Hardware Dept., will be happy to assist you! 8 cu. ft. Back-up power cord installed. 484000A. 3.5" x 15 x 32. Use with 2x4 stud walls. 1199. Tough, laminated, double-layer, random cut design. Made with a fiberglass mat. Backed by a 30-year warranty, with 5-year Full Start, limited transferability and a 60-month limited warranty against damage from winds up to 70mph. Choices: Grey Weathered Wood, Rustic Redwood, Harvest Gold, Painted Desert, Glacier White, Autumn Brown, English Pewter, Rustic Cedar. * (101803A, 101806A, 102082A, 102343A, 102229A, 104547A, 104549A, 104545A). Hip & Ridge available IN STOCK! *Subject to stock on-hand. Can be nailed directly to the studs for faster installation. Pre-primed surface. 7/16” x 4’ x 8’. 18419A. Subject to stock on hand. 6.5" x 15" x 24' roll. 108637A. Forms permeable membrane which prevents liquid infiltration but allows moisture vapor to vent. Long term field testing shows that MicroPro® treated wood provides effective protection against fungal decay and termites attack. First Wood Treatment Process to receive EPP Status. Lighter, more natural wood appearance. Improved painting and staining qualities. Better corrosion resistance for code-approved fasteners and hardware. Also available in Red/Brown. ALL Red/Brown Treated NOW KILN DRIED! *Subject to stock on hand. 12" x 20' (105910A) 18" x 20' (105913A) 18" x 24' (105916A) 24" x 20' (105919A) 24" x 24' (105922A) While Supplies Last. Tanks Seamless one-piece heavy-duty construction. Exceed cold weather requirements. Extra thick wall for insured safety. FDA approved materials. Three year warranty. Competitive prices. Deep tie-down lugs, vented lids on all tanks. Ultraviolet ray protection. Molded in gallonage marker. 1"x 4" x 6’ (16828A)................................. 169 1" x 6" x 6’	(10989A)................................. 289 *Subject to stock-on-hand. Stores more than twice a gravelfilled trench. Easy-to-install, lightweight, easy-to-handle. Approved by HUD and FHS. High capacity. 26449A. A heavy-duty winch and cable lifts the chute into a transport position where it is secured with four pins. Not for highway use. 1777. Rims included. Tires not included. 2" x 4" Mesh, 5/8" x 6" screws. All gates are 4” shorter than listed length to allow for gate hardware and proper clearance. Subject to stock-on-hand. Heavy 14 gauge tubing. Standard Corral Panels are 60’ high. One piece, molded. Extra heavy duty, molded rim. Subject to stock-on-hand. Premium G90 galvanized, corrugated sidewalls and extra heavy (20 Gal.) galvanized tank bottoms. Heavy reinforced steel tube rolled into the top lip for added strength. *Subject to stock-on-hand. *Each pipe is approximately 31’ long, Sold by 31’ joint only. 48”, 10 wire gauge. 12.5 stay gauge. 100ft. roll. 16231A. Standard Cattle Panels 50” x 16’, panels. 14764A. Subject to Stock-on-hand. 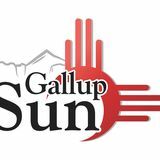 16’ (14915A)	Gallup Lumber & Supply is your headquarters for all the fence and fencing supplies for your fencing project. 9 NEW MUGS! Come in today to see our new selection of Pendletons. Scotts® Turf Builder® Grass Seed, 3 Lb. Ortho® Home Defense® Insect Killer Ready-toSpray, Granules, Concentrate or Ready-to-Use. Ace 16 Oz. Propane Cylinder 2/Pk. Folding Rocker Chair 8015006. Offer good 4/1/19-4/15/19. * Ace Rewards card Instant Savings (“Instant Savings”) amount is available only to Ace Rewards members in store (see store for details). Where applicable by law, tax is charged on the sale price before application of Instant Savings. You must present Ace Rewards card to receive Instant Savings in store. Instant Savings listed in this advertisement are valid through 4/1/19-4/15/19, at participating stores. Prices good April 1-31, 2019 unless otherwise noted. For Quotes & Bids: Fax: (505) 863-3344 Be placed on our mailing list by calling or email: gladv@glslumber.com **Subject to stock on hand. Prices subject to change without notice. We reserve the right to correct printing errors. Prices cash and carry. Delivery available at extra cost. FOB our yard. Items may vary from illustrations.